The municipal bond sector is not immune to volatility in energy prices, specifically, the recent declines in per barrel price of oil. 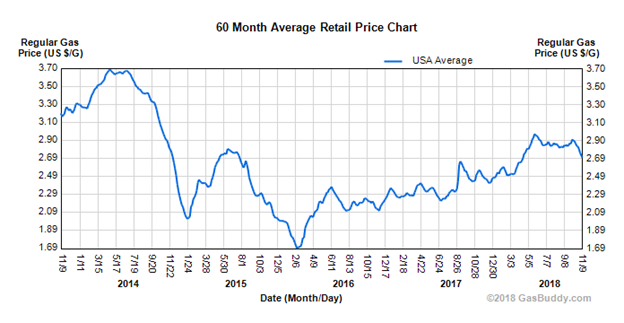 While the price of oil has slowly rebounded from the lows in 2016, October 2018’s per barrel price decline harkens back to December of 2014. Growing oil production in the U.S. combined with the uncertain impacts of Iranian sanctions could signal continued volatility in oil movement and capped upside for the foreseeable future. 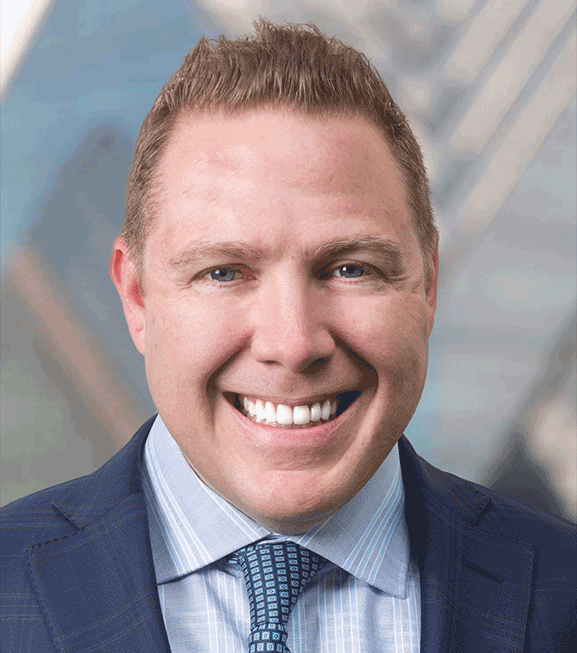 However, the degree of impact on municipal bonds can be varied, with falling oil prices creating potential headwinds for state level credits and a slight tailwind for revenue backed transportation bonds. Individual states’ reliance on oil pricing can be quite diverse. States who are most dependent on oil production and associated industries can see their fortunes rise and fall in line with per-barrel crude prices. One way that states monetize their exposure to the energy industry is through severance taxes, with Alaska, Louisiana, Montana, New Mexico, North Dakota, Texas and Wyoming making the list of impacted areas. Alaska leads the way in terms of states that are dependent upon severance taxes, while Louisiana and Texas fall to the bottom of the rankings. So what does this mean for municipal bond investors? Credit spreads for oil dependent states such as Alaska and Louisiana for example, tend to move inversely to per-barrel price movements in oil. While oil pricing declined post 2014, spreads in each these two states widened as their finances came under pressure. Conversely, spreads in both states have steadily tightened as oil rebounded off the $30 lows of mid-2016. 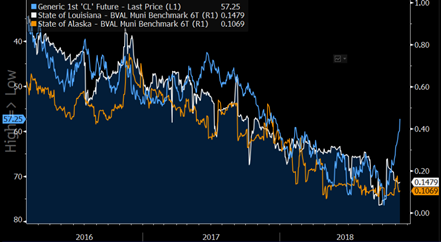 This makes the current break in the relationship between oil and muni spreads all the more interesting, as oil has fallen almost $20/barrel and spreads for both Alaska and Louisiana remain near their lows. How much of this is due to supply/demand dynamics in the tax-exempt market is hard to parse out; however, a persistent range bound level for oil or even a leg lower, could provide cheaper entry points into the state debt for each of these entities. When looking at revenue backed transportation credits, we can point to a historical relationship between periods of declining oil prices and a corresponding decline in both retail gas prices and aviation fuel prices. The impact of extra dollars in the hands of consumers can result in additional travel volume for both the roadways and airports, helping strengthen debt coverage ratios within the sector. While the latest drop in oil prices has not yet resulted in a decline in either of these fuel prices, we believe the potential for declines is expected over time. Lower oil should prove to be supportive for transportation backed revenue bonds; however, the larger challenge the sector may face could come in the form of a renewed interest in infrastructure legislation. One piece of legislation being discussed by congress would increase the passenger facility charge to help pay for airport improvement projects. Additional fees that would be folded into airline ticket prices would serve to offset any traction made from declining fuel prices. Any increase in the national gas tax would also serve to offset declines from sustained lower crude oil prices. At Clark Capital Management, we continually monitor these types of macro-economic trends and events to help us determine portfolio diversification, credit positioning and sector selection within our Tax-Free Municipal Bond Strategy. As always, we believe it’s important for investors to stay focused on their long-term goals and objectives and not short-term fluctuations in the market—including oil prices. This is not a recommendation to buy or sell a particular security. This information should not be considered to be a recommendation to buy or sell a security or to adopt a particular investment strategy. Clark Capital Management Group, Inc. (“Clark Capital”) is an investment adviser registered with the U.S. Securities and Exchange Commission. Registration does not imply a certain level of skill or training. More information about Clark Capital’s advisory services can be found in its Form ADV, which is available upon request.